Day 30 – 30th March 2017 – what crafts would I like to learn? There must be a whole host of undiscovered crafts out there, ones I have never had a whiff of! I can think of a few I am not interested in but there must be so many more and I look forward to finding them. Day 31 – today – end results – two completed baby jackets, both photographed recently, three quarters of a cardigan for me, also photographed in progress – that’s one thing I had really hoped to complete! I have sewn as well as knitted – I made felted doughnuts – 10 large, 10 small, 4 embroidery hoops with freehand machine embroidery and hand stitching, a french stick bag – oh I haven’t photographed that yet – that’s for me to take to our house in France. It’s taken 10 years of saying ‘I really could do with some kind of long bag to keep our bread in! I have semi-sorted my yarn stash, been shocked at how much I had and why I purchased a lot of it. I’ve sold 11 lots of yarn in online auctions and gifted two bags of crafting things to charity. All in all my crafting world at home has been attacked and it felt good. Spring has sprung here in the UK. Perhaps a lot of this sorting out has been a little bit of a Spring Clean! I made an awful mess along the way! This entry was posted in Uncategorized and tagged craft, knit, knitting, Naknicromo, sew, Spring. I decorated a pottery yarn bowl at a Pottery Painting shop early this month – oh what fun ! I was slightly worried my attempt at painting anything might look like a child’s artistry (my ‘skills’ tend to be woolly or in fabric) but luckily with a little help of a ‘magic’ paint I think the finished product was a success. I was reluctant to post pics until it was fired in case it was a disaster. Mine’s on the left. I painted a pattern you can’t see too well(! ), covered it with a white glaze that went black and ‘cracked’ on firing. My friend Susan (her bowl on the right) was painted in green/blue, then a grey glaze was painted on and the ‘bit’s in the glaze exploded on firing changing the colour and giving a lovely marbled effect. Finished and in use ! So, Love this Cardigan is growing. Now I have the two fronts and almost the front. Meribel yarn by Schoeller and Stahl is lovely to work with but will be a nightmare to sew up with so I am scrabbling around in my stash to find a good sewing up yarn, one that won’t break when I pull together mattress stitch. NaKniCromo, the yarn challenge for March on Ravelry.com is almost over. Day 26 Projectless yarn? Yes – lots of it – here is just some …. and currently sorting my stash so much more is projectless. Day 27 – For those who know me, I am never working on one thing at the same time. I have ‘easy’ knitting which is portable (eg in the car or with me for knit club when I can chat, drink coffee and not go home with mistakes that need ripping out later), then slightly more difficult knitting for when I want a challenge. I have WIPs where I have got bored or stuck or gone wrong – they go into storage and often take a little while to finish or I never finish them! Day 28 Share my Progress – see above, Love this Cardigan in Meribel teal and navy blue – love love love this cardigan is what I shall call it! Day 29 Any Other Crafts? Yes, as blogged here, I sew a bit too. Doughnuts and Embroidery Hoops on recent posts. I have also tried others, hand felting, cross stitch, mosaics are amongst them. Oh, and I did silk painting and card making as well. I guess I have a brain that loves to create and try new things. Day 30 – tomorrow – Crafts I would like to learn – thinking …. Have a great day, whatever you are doing. And if anyone wants to suggest a project for that projectless yarn please feel free to do so – I have 150g/150m chunky yarn, variegated. It’s Adriafil Mistero, acrylic and wool. This entry was posted in Uncategorized and tagged Adriafil, doughnuts, knitting, Love this Cardigan, Meribel, Naknicromo, Pottery, ravelry, sewing, yarn. I have had more time recently and what have I done with a lot of it! Wasted it! Why is it that the more time one has the less efficient one can be? I aim to do better during the next few days. 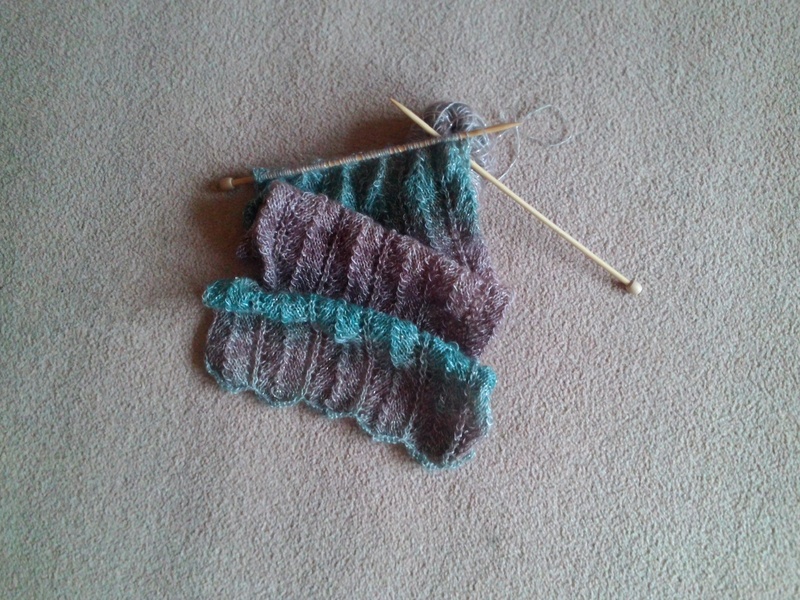 Works in progress – Love this Cardigan – it’s growing steadily. I now have 2 fronts and this much of the back of it. Schoeller and Stahl Meribel is great to work with. Day 13 Fave Tool – KnitPro Symfonie needles, prefer the straights but use interchangeables too – occasionally the screw comes undone though, which makes a knit frustrating. Whilst functional is just not pretty. Must get on, yarn to store prettily and projects to finish. What’s on your pins or what are you sticking with needle and thread? This entry was posted in Uncategorized and tagged cardigan, crafty, knit, Meribel, ML181, Naknicromo, Pinterest, ravelry, yarn. Day 9 of the NaKnitCroMo challenge on Ravelry.com – though in reality it’s actually Day 11 and I am catching up. When? Mainly the evenings if it’s knitting. I cosy myself up on the sofa, cat to the left of me, after dinner, if I am knitting something easy then the tv is on too. If it’s sewing, by machine, then that’s a daytime thing. I usually want to be on my own in the house, no husband to pop in and interrupt me – risking me sewing through my own fingers or going askew on the piece I am sewing. I often think he feels my sewing efforts are a waste of time – he doesn’t ‘get’ the pleasure made from handcrafting. Day 10 of the NaKnitCroMo challenge – What’s my crafting fuel? Day 11 – today – What do I listen to when crafting? As I said, when knitting, it’s usually the tv. When sewing, I love catching up on BBC London Radio (JoAnne Good in the afternoon, particularly The Barking Hour on Thursday afternoons or I love a bit of Robert Elms and his listed Londoner slot), or my cds – a bit of retro 1980’s/1990s’s – my era, when I knew all the words and sang along – maybe that’s why I sew alone at home – then there’s no shame in singing along out loud and out of tune, ha ha! Depending on the mood of the day – Fleetwood Mac, for a singsong, Enjya for thoughfulness, Cher for a jig about when ironing fabric, bit of newer stuff, eg. Mumford and Sons – husband would definitely head out of the house for Mumford – he hates them. Loving this challenge – it really makes me think how and why I craft. Latest knitting news – I guess part of the March challenge but this might slip into April. I have finished both fronts of my ML181 Love this Cardigan. I have sold some of my stash which has been quite carthartic – you know those yarns you have had for ages and just aren’t going to be turned into something as you have either gone off them, or just don’t have enough in quantity? – they’ve gone to good homes. I have (accidently) purchased some yarn for a couple of baby projects. A friend in Belgium is due in May – I haven’t started anything yet – got to get my sticks clicking – not sure if it’s a boy or a girl, hoping this lovely shade of yellow will be a good choice. DROPS Merino Extra Fine in light yellow. (Great local yarn store – http://www.littlewoollie.co.uk/ – always a warm welcome from the owner Trudy.) ‘Accidently’ purchased as I have plenty of yarn still in my stash – but this was irresistable and DROPS is reasonable prices and good quality. This entry was posted in Uncategorized and tagged BBC London, crafty, DROPS, handcrafting, JoAnne Good, knitting, littlewoollie.com, Naknicromo, ravelry, Robert Elms, sewing, Stiches, yarn. Day 8 – popped a pic on Ravelry.com, can’t put another on a fellow member of this group’s blog post, so here’s a mini post from me. Today, in my sitting room, knitting a bit, and this is where I usually prefer to wield the needles. My ‘helper’ is Mercury, one of my moggies. His sister, Matilda, escaped the photo session. And Yes, I like teal but it wasn’t until I brought home this yarn purchase that I realised I might just ‘disappear’ into the furniture in future when I am wearing the finished cardigan! This entry was posted in Uncategorized and tagged cardigan, knit, Naknicromo, ravelry.